Street Views: 15 and 13 Suppl. 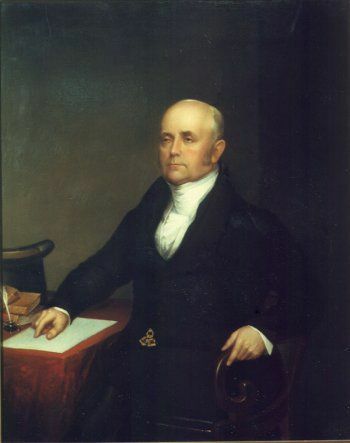 Jacob Perkins was much more interested in inventing new things than in running a solid business, frequently exasperating his partners as he withdrew large sums of money from the business to fund his inventions, and in November 1824, G.T. Heath withdrew from a partnership he had with Perkins at Regent’s Park. (5) This seems to have been a separate partnership from the Fleet Street one. 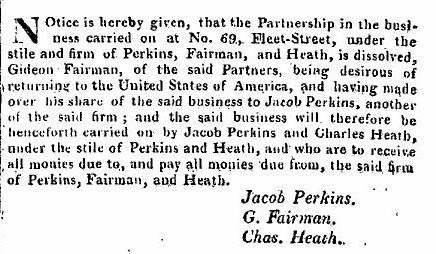 The remaining partner, Charles Heath, dissolved the partnership with Perkins in Fleet Street in January 1826. (6) In May 1929, Joshua Butters Bacon, who had married Jacob Perkins’ second daughter, joined the business and it became Perkins and Bacon. In 1834, Henry P. Petch was taken into the partnership – he had joined the firm in 1823 as an engraver – and the company became Perkins, Bacon & Petch. According to the censuses of 1841, 1851 and 1861, 69 Fleet Street was not occupied as a house, or at least, no one slept on the premises when the census people came round. The Perkins family may of course have lived above the business before 1841, but they had moved out by the time of the first census. In 1841, Jacob could be found living in Great Coram Street with his son Angier, his daughter-in-law Julia, and his own daughter Henrietta. After Angier left his father’s business in Fleet Street, he established an independent business as heating and steam engineer, first at Harpur Street, Holborn, but after a few more moves, he settled in 1843 at 18 Regent Square, where Jacob also came to live and where he spent the last years of his life. Jacob died on July 30th 1849, aged 83, and was buried at Kensal Green. 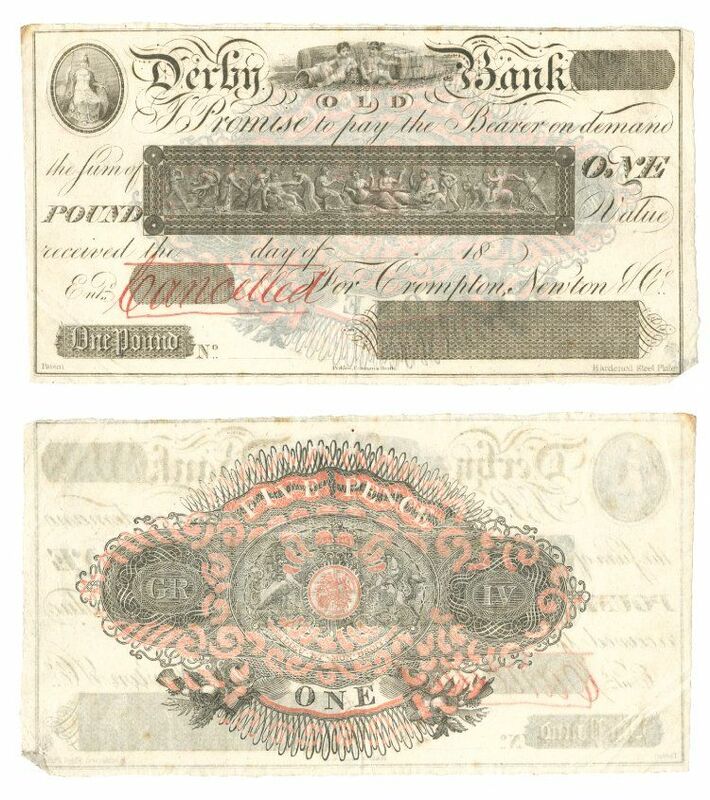 Jacob’s method of printing bank notes in several layers with ‘siderographic’ plates to combat forgery also attracted Sir Rowland Hill, who was a friend of Jacob, and Perkins, Bacon & Petch obtained the contract to produce the Penny Black, which was first issued in 1840. 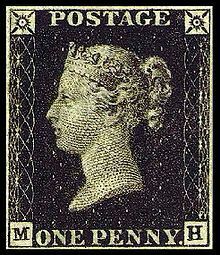 Within a few years, twenty-two thousand million stamps for Great Britain and the Colonies had been printed by the Perkins process. 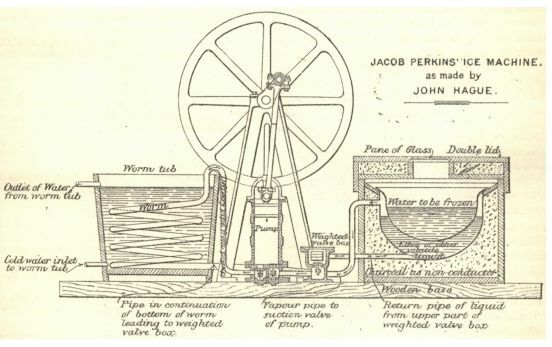 ice-making machine as invented by Jacob Perkins (patent 1834, no. 6662) and constructed for him by John Hague and two of his apprentices. According to one of them, Frederick Bramwell, it actually did produce ice. Bramwell described the process and drew the sketch in a letter to the Society of Arts who published it in their Journal (8 December 1882). 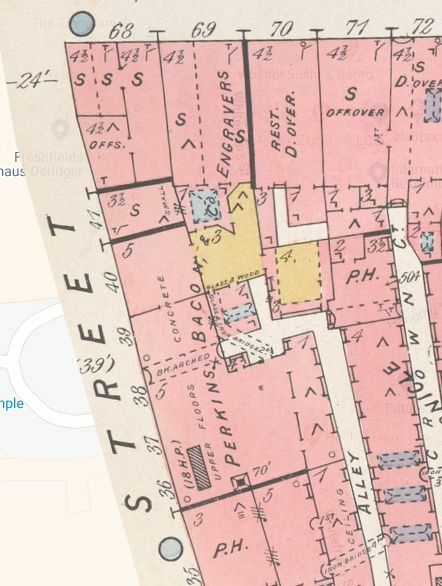 According to the 1886 insurance map, the engravers’ workshop ran backwards from 69 Fleet Street towards Whitefriars Street, comprising house numbers 36-40. You can still see the division at number 69 where first Chaffin and later Robinson had their shop. 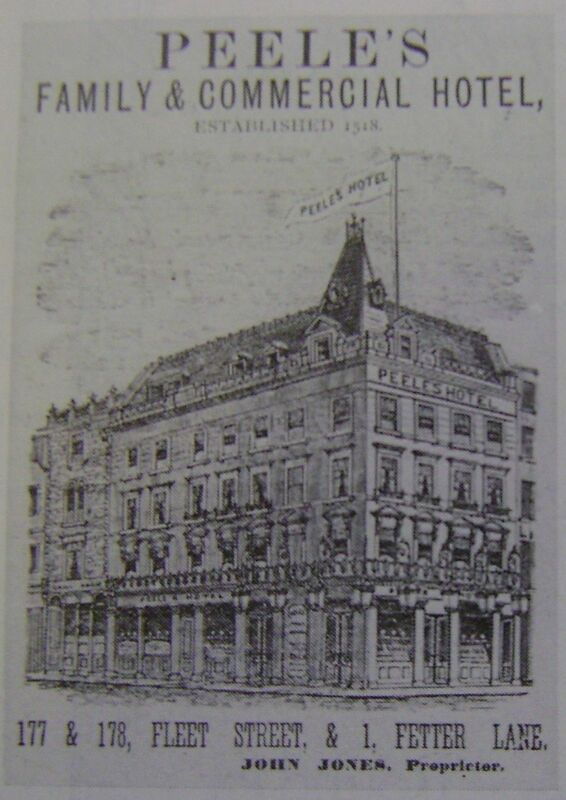 Following the death of Henry Petch in 1887, the firm became Perkins, Bacon & Co. Ltd. In 1904, they moved the business from 69 Fleet Street to Southwark Bridge Road. (1) Website Baker Perkins Historical Society, see here. (2) The London Gazette, 19 August 1820. (3) The London Gazette, 20 October 1821. (4) The London Gazette, 3 August 1822. (5) The London Gazette, 23 November 1824. (6) The London Gazette, 28 January 1826. (4) G. Bathe and D. Bathe, Jacob Perkins: his inventions, his times, and his contemporaries (1943). Quoted in the Oxford Dictionary of National Biography entry for Angier Perkins. Louis Ferdinand Colas was born in Rémalard, Normandy, France, in ±1821, and was listed in the 1841 census as Louis Colas, a 20-year old French box maker, living at Lower Marsh in the household of Francis Moque, cheesemonger. This Francis Mouqué was officially called Francis Augustus Mouqué (also spelled Mougue or Mouque without the accent) and came from Ostend, Belgium. His wife, whom he married in 1835, was Susanna Marian Reid; she is called Marian in the 1841 census, but Susanna in the 1851 census. The same confusion of names occurred with Louis Ferdinand Colas who was named Louis F. in the census and other records, but more often just Ferdinand Colas. In the 1845 and 1848 Post Office Directories, Colas can be found at 55 Fleet Street as a box manufacturer and Mouqué as an engraver at the same address. At some point before 1850, Colas and Mouqué entered into a partnership and moved to 105 Cheapside. The 1850 Post Office Directory confuses the two addresses and lists Colas at both 105 Fleet Street and 105 Cheapside. Here again, they rented the property, as the Land Tax records show other names; in 1852 Messrs Smith (Simpson) and in 1858 Wilson & Morgan. The move to Cheapside coincided with an additional line of business as they not only produced fancy boxes, but also daguerrotypes. 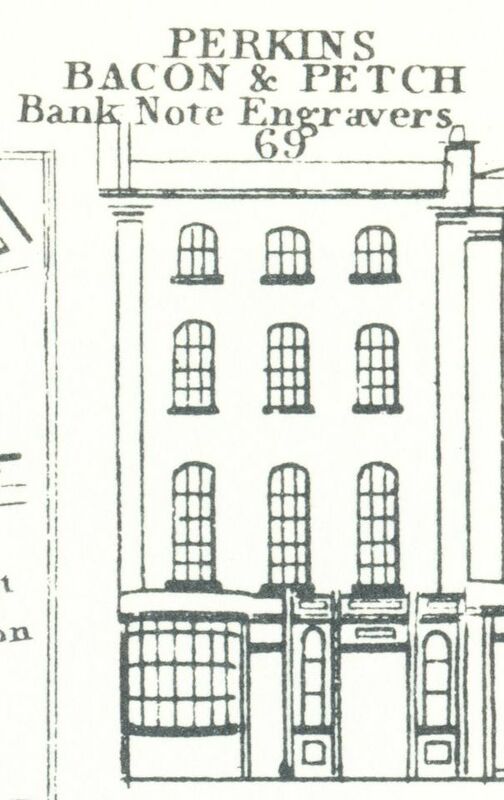 In The London Gazette of 1 December 1854, Mouqué and Colas announce that they have dissolved their partnership with Colas to continue the business at Cheapside. Mouqué had another change of occupation and is listed in the 1861 census as warehouseman of a shirt maker. He died in 1868. Colas seems to have concentrated on his original work, the making of boxes, and in 1865 removes the business to 57 Cheapside. However, a year later he is to surrender himself in a charge of bankruptcy and is then listed with the addresses 9 Westmoreland-buildings, Aldersgate Street, and 28 Hildrop Crescent, Camden. Earlier that same year he had been elected to be a member of the Freemasons’ United Grand Lodge, but if he thought that network might be useful to him, he was mistaken, as in 1870 he is once again asked to surrender himself to the Registrar of the Bankruptcy Court. He is then listed as of 32 Norfolk Road, Dalston and of 40½ Monkwell Street, late of 232 Fore Street and before that of 112 Fore Street. Fancy box making was apparently not quite as profitable as it had been. 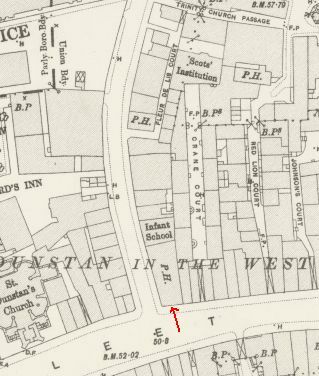 The 1871 census still lists him as millboard box maker at 32 Norfolk Road, so he must have been able to turn things round to continue his business. He died in 1876. In 1850, our box maker L.F. Colas of 105 Cheapside had written a booklet on photography in which he explained the difference between the French and the American method of polishing the plates and the composition of the accelerant used. In his text he refers to Mr. Claudet whom we have come across in this blog as one of the partners in the firm of Claudet & Houghton, glass dealers (see here). Daguerrotypy, or the Daguerro process, had been invented by Louis-Jacques-Mandé Daguerre in 1839 and became a readily available method of photography until ±1860 when easier and cheaper methods were developed (see here). In the 1840s, a lot of people jumped on the bandwagon and started a Daguerrotype studio in addition to their regular business. It seems that Mouqué and Colas did just that. The publishers of Colas’s text, Lerebours and Secretan, were well-known manufacturers of optical instruments and photographic supplies and at some point Colas may even have learned the art of grinding lenses from Lerebours, as lenses exist with the text “L.F. Colas élève de Lerebours Paris”, although it is not absolutely certain that the L.F. Colas who worked in London was the lens maker (information from earlyphotography.co.uk; see also here). It is even possible that he just imported the lenses. Whatever the true involvement of box maker Colas with the grinding of lenses will, for the moment, have to remain an unsolved puzzle for lack of evidence, but that the box maker from France was involved in early photography in London is certain. 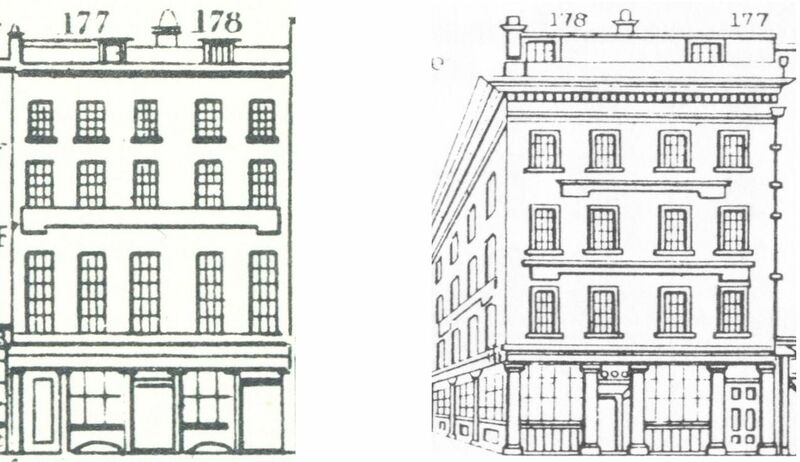 The 1839 situation on the left with the coffee house still attached to number 179 (Tallis mixed up the numbers 177 and 178; 177 should have been on the right and 178 on the left abutting the house that disappeared) and the 1847 situation on the right with the coffee house having one side in Fetter Lane. 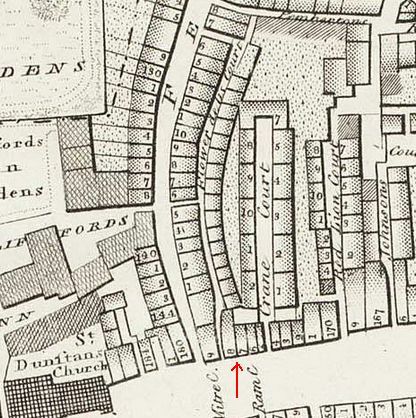 The left-hand door of the premises in the 1839 situation gave access to Fleur de Lys Court which disappeared almost completely when Fetter Lane was widened. You can see the court clearly between numbers 178 and 179 in Horwood’s map, but in the Ordnance Survey map of a century later, all that remains is the top section. Peel’s coffee house marked with a red arrow. In January 1847, the then proprietor of the coffee house, Mr. Austin, applied to Mansion House because of “an annoyance”. Someone had put an advertisement in the Manchester Guardian headed ‘Matrimony’, solliciting ladies to send in letters directed to T.A.D. at Peel’s Coffee House. T.A.D., whoever he was, had not agreed beforehand with Austin to have the letters kept for him at the coffee house and besides “it was needless to say that the advertisement came from one of the rascally adventurers” preying on “inexperienced ladies”. Austin was most upset by one of the letters in which the brother-in-law of a lady invited T.A.D. to his house without the lady knowing about it, so that “if a mutual liking were not likely to arise from the acquaintance, a termination could be at once put to it without the least chance of inflicting pain”. Charming! How to get rid of a surplus sister-in-law. No comment was made in the paper on the fact that Austin had apparently opened the letter(s). Privacy? The Lord Mayor asked Austin whether anyone had called for the letters and whether Austin had given them up to that person. A “sollicitor of respectability” had called for the letters, but Austin had refused to give them up and told the sollicitor “that [he] should hold him up to public contempt for engaging in so disgraceful a transaction”. After the T.A.D. affair, a similar advertisement had appeared in the papers, professing to come from A.Y. who said he was of the legal profession and looking for a wife and “that he would be found very useful to widow ladies who might be entitled to property from their deceased husbands’ estates or the estates of others, and that he would exclusively devote his attention to the comfort of any lady with whom he might be united. (Laughter. )”(2) Have not found out if they ever caught the fellow, or whether the exposure in the papers was enough to stop him. 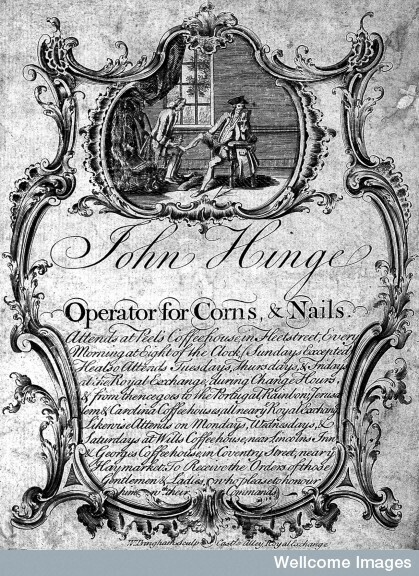 But if matrimony is not what you were after, you could always retire to Peel’s Coffee House to have your corns or awkward nails attended to as every morning at 8 o’clock John Hinge was available to solve your problems. 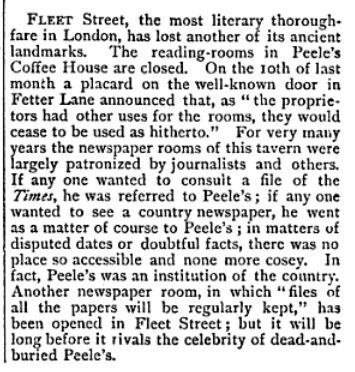 Peel’s was also known for its collection of complete runs of the London and most provincial newspapers, which were kept for reference in the reading room and because of this easily accessible source, Peel’s was a favourite haunt of gentlemen of the literary and legal professions. Charles Dickens was often to be found at Peel’s. (3) But, in 1874, it all came to an end; the rooms were needed for other purposes. 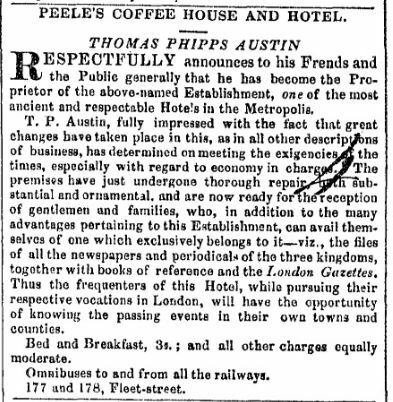 Mr. Austin who complained about the matrimony advertisements, was Thomas Phipps Austin who had taken over the establishment in early 1845. 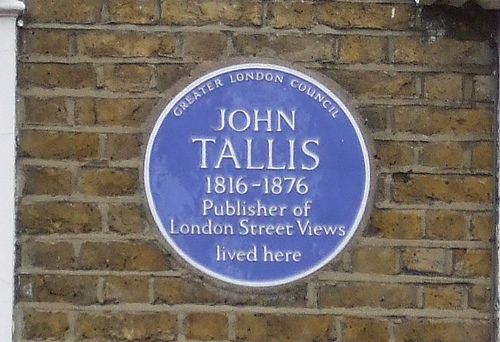 Tallis indeed gives the proprietor of the coffee house as Austin in the 1847 edition, but in the earlier edition, he mention the name of Moore. I have tried to work out who the proprietors were from 1715 to 1900 from the Land Tax Records and, among other sources, the information on the pubhistory site, but the list is not complete. If you have any additions, please leave a comment. 1715-1718 Edmund Peel (Land tax). 1719-1735 Thomas Babb (Land tax from 1719; PROB 11/674/358, he died February 1735). 1735-1736 Rebecca Babb, the widow of Thomas (paid Land Tax in 1735; died May 1736). 1738 John England (Land tax). 1739-1745 John Woods (Land tax). ?1753-1774? Richard Bulkley (Land Tax 1753-1768. In a petition of 1774 he says he has kept (past tense) Peel’s for 23 years, but does not give extact years). ?1777-1802 Thomas Gurney (mentioned in Daily Advertiser, 20 June 1777. PROB 11/1378/52; he died on 30 June 1802). 1802-1823 Mary Gurney (PROB 11/1678/222; the widow of Thomas Gurney. She died on 21 September 1823 and left everything to her son William). 1824-1826 William Gurney (Pigot’s Directory), probably earlier together with his mother as he is mentioned as the proprietor by B.R. Haydon in his diary for 1808. 1827-1843? W. Moore (Land Tax, Tallis and Post Office Directory, 1843). 1853 Land tax record hotel left blank; Thomas P. Austin is charged for a house in Fetter Lane, corner Fleur-de-Lys Court. 1854-1858 Thomas Moreton Johnson (Land tax: charged for the same house in Fetter Lane; hotel left blank. Post Office Directory, 1856. Transferred his licence on 4 Dec. 1858 to Brown (The Era, 12 Dec. 1858). 1858-1860 Neville Brown (Old Bailey case t18600813-689; went bankrupt in 1860). ?1863-1875 Thomas Winterbotham (Land tax; house in Fetter Lane 1863). 1876-1888 John Jones (Post Office Directory, 1884. He died 28 Feb. 1888. His name appears on the card the Rev. Croft found, see below). 1889-1900 Mary Ann Gill Jones (Land tax; the widow of John Jones). (1) Collage has a picture of the coffee house which they originally dated to c. 1820, but as it shows the new situation, that is, after the widening of Fetter Lane, it must be later. After correspondence with LMA, they agreed and will change the date to c. 1845. They say that the costumes worn by the figures in the picture also indicate the later date. As I don’t know much about fashion, I am quite happy to take their word for it and am glad to have this corroborating ‘evidence’. See here. (2) The Morning Post, 29 January 1847. (3) W.G. Bell, Fleet Street in Seven Centuries (1912), pp. 505-506. (4) “An innocent family skeleton” in Country Life, vol. 156 (1974), p. 1656.